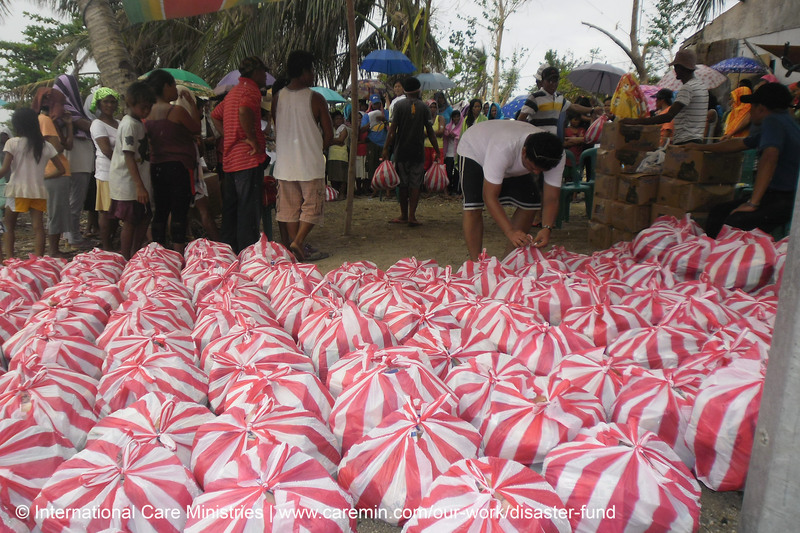 On December 5, ICM staff revisited Logingot Island for the first time since our initial visit two weeks prior — this time to distribute more relief packs for 220 families. During this trip, we got the privilege to speak with several mothers who shared their experiences during and after Typhoon Haiyan. Caridad Alman is 41-years-old and the mother of 6 children. Caridad’s husband makes a living as a fisherman, as do most people living on this small island. Caridad’s small home is on the shore of Logingot Island and is made of bamboo and nipa. After the destructive winds and rains of Typhoon Haiyan, which forced the family to abandon their collapsing home, simmered down, Caridad returned to the little that was left standing. 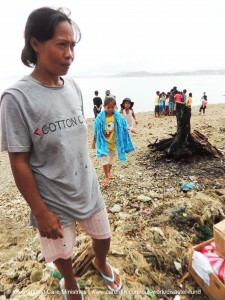 Her husband lost his ability to support his family as fishing boats were also destroyed. With no money and no resources to begin rebuilding, the entire family is living in the half of their home that weathered the storm. Another mother, Analyn Diaz, told ICM staff with tears in her eyes that she will never be able to forget this disaster and the devastation it caused. Analyn and her family lost their house, despite her husband’s efforts to prevent it from collapsing during the storm. Currently, they are all staying with one of Analyn’s relatives. It scares Analyn not knowing when relief will stop arriving because she does not know how she will care for her child if the food runs out. 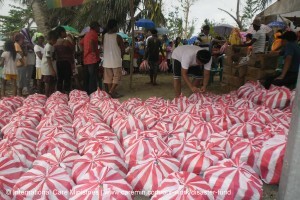 ICM’s relief pack distribution tangibly boosted the morale of this community. People were smiling and joking with one another. 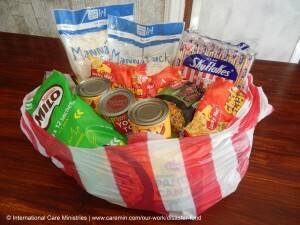 Mothers expressed their deep gratitude for the relief food. 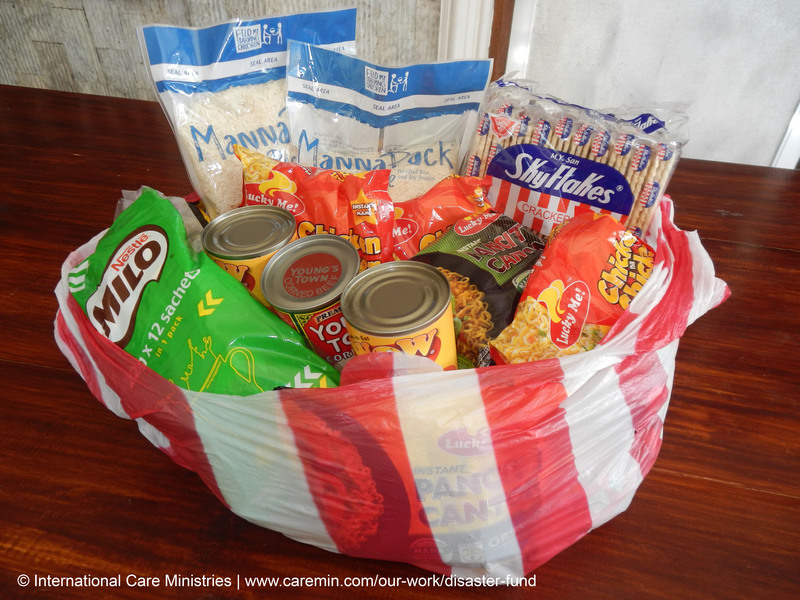 Each family received 10 packs of nutrient-fortified food, 10 packs of noodles, 3 canned food items, 1 pack of Sky Flakes biscuits, and 1 pack of Milo drink. Although healing will take time, everyone seemed determined and motivated to begin picking up the pieces of their old homes and building new ones. Analyn and her friends walked away from the relief distribution knowing that they have enough food for the next few days. For a family of 5, each pack should last 4 days. Below is a picture of the group, free of their worries about finding food for tomorrow. 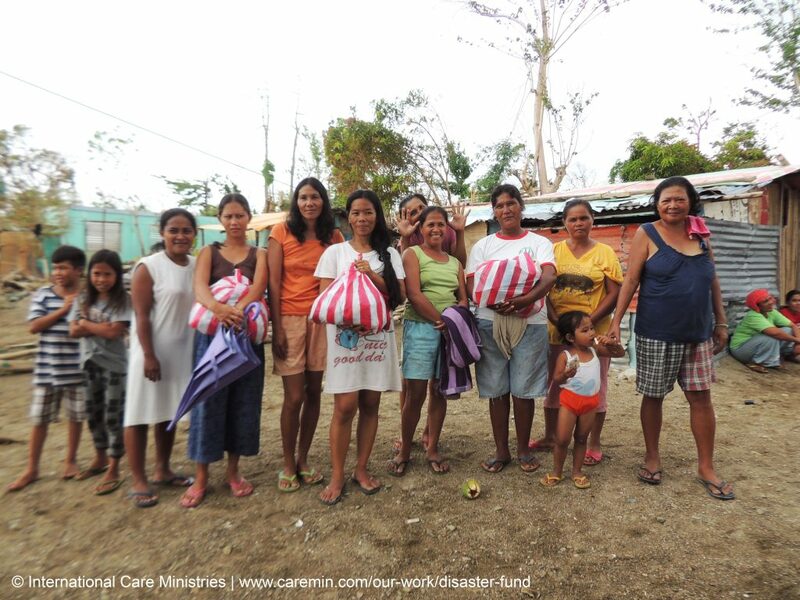 Join ICM in providing short-term, mid-term, and long-term relief to typhoon victims and mothers like Caridad and Analyn by donating today at www.caremin.com/our-work/disaster-fund.